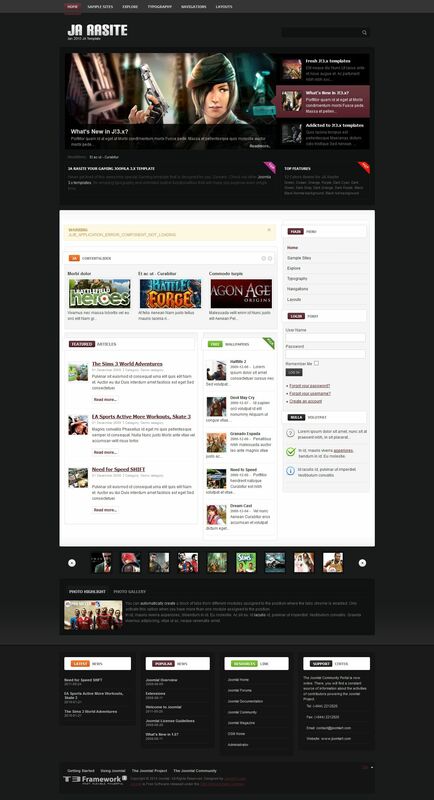 JA Rasite - The main theme of this pattern - computer games. Thus it is quite versatile and has 12 color design options. Colors for the template JA Rasite grouped into three groups: light - 4 variants, dark - 5 options, plus bonus - 3 options that will make it even easier to configure. JA Slideshow module updated for greater ease of use. The template JA Rasite applied new, updated menu JA Mega Menu. It added a new tab Parameters (JA Extended) significantly improves the setup menu. Template JA Rasite uses developed by JoomlArt T3 Framework and provides features such as choice of text direction (left-to-right or right-to-left), a built-in optimization for portable devices, full compatibility with W3C.